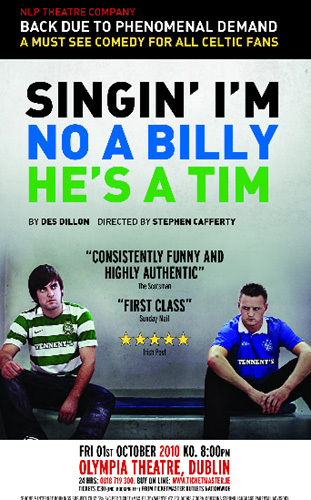 Courtesy of MCD Promotions Soccer-Ireland.com can offer you the chance to win two tickets to the hilarious and hugely entertaining Singin' I'm No A Billy He's A Tim. What happens when you lock up a Celtic fan? What happens when you lock up a Celtic fan with a Rangers fan? What happens when you lock up a Celtic fan with a Rangers fan on the day of the Old Firm match? Des Dillon creates the situation and watches the sparks fly as Billy and Tim clash in a rage of sectarianism and deep-seated hatred. When children have been steeped in bigotry since birth, is it possible for them to change their views? "Celtic jerseys are not for second best, they don't shrink to fit inferior players"
The closing day for entries is 5pm on Friday 17th September 2010. The winner will be drawn from all of the correct entries on Monday 20th September and the winner will be notified by email. The winner's name will be posted on the home page once the draw has been made. Billy, a die-hard Rangers fan, and Tim, a faithful Celtic supporter, are locked up together on the day of the Old Firm Match. Can Harry the ever watchful turnkey keep them apart? NLPs phenomenally successful production Singing Im No a Billy, Hes a Tim is returns to The Olympia Theatre, Dublin for 1 performance only on Friday 1 October, 2010. Tickets are on sale now. Singin' I'm No Billy, He's A Tim featuring Scott Kyle winner of The Best Stage Actor at the Edinburgh Festival this year! A powerful comedy with a serious message, Des Dillons play highlights the nature of bigotry and sectarianism within the West of Scotland, earning the Company endorsements from high profile politicians including Alex Salmond MSP, First Minister of Scotland, and Jack McConnell MSP. Cast includes Artistic Director Scott Kyle, who trained at the Glasgow College of Nautical Studies, Colin Little, who has worked with Baldy Bane, and James Millar. Previous runs of the show have been described by The Guardian as reaching the parts that other theatre cant reach, as well as one of the shortest and most gripping two-hour shows in current Scottish theatre by The Scotsman. No Limit People Theatre Company was set up in 2005 by Scott Kyle, whose intention was to make a positive contribution to the arts industry in Scotland. NLP Theatre aims to produce work that will entertain and entice new audiences along to the theatre, increasing the amount of people attending theatre throughout Scotland.